I love hosting Friday night meals. A truly fresh, not reheated meal really adds to the Shabbat vibe. When I host a Shabbat lunch, I’m limited to dishes that taste great when reheated and don’t have a liquid component. I also like serving chicken and meat, and I have yet to find a meat recipe for the crockpot that doesn’t come out tasting like cholent. Honestly, I feel like I’ve tried everything! There is one thing, though, that I do enjoy making for Shabbat lunch. Okay, I lied – two things actually. My spring rolls and my chummus v’basar (hummus and meat) platter. I never ate chummus back in the States; something about it just did not appeal to me. When we got to Israel none of that mattered – every meal we went to started off with chummus and salatim (literally salads, more like dips that go well with bread) whether I liked it or not. Slowly, I fell in love with chummus. But not the store bought kind. I prefer the deliciously creamy homemade variety. I set out to work on my own chummus recipe, but very quickly that morphed into something more: chummus v’Basar! And I’ve been serving it ever since. With Purim coming up soon, you better believe I’ve been pouring brain power into coming up with new kinds of hamantaschen. At the same time, I want to take advantage of the fact that Purim this year is right after Shabbat to infuse my Shabbat meal with Purim spirit. And that’s when it hit me: pita hamantaschen with chummus v’basar filling! 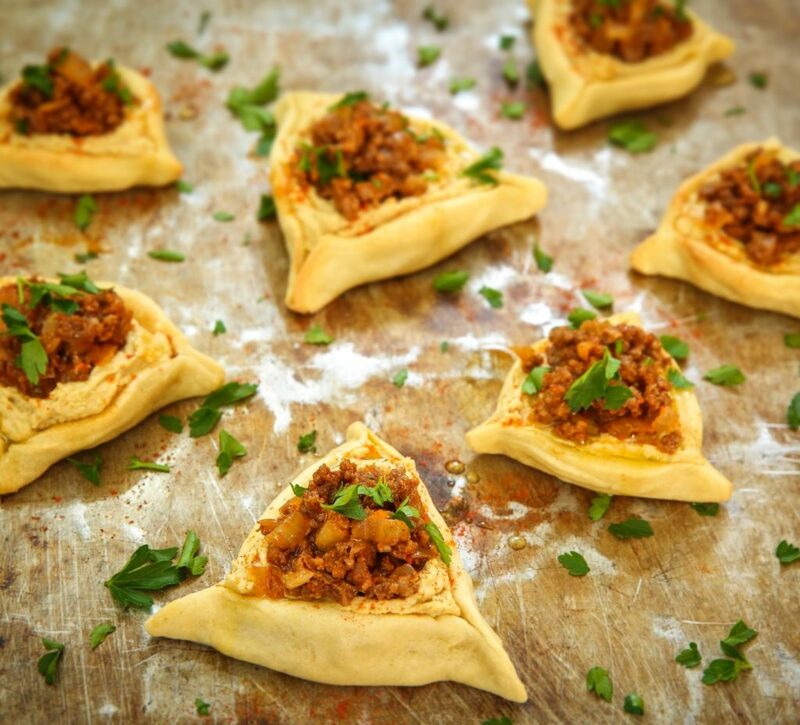 It felt like the perfect way to take my homemade chummus to the next level while making the cutest Purim-themed appetizers, perfect for a pre-Purim Shabbat! I used my pita dough recipe from my shakshuka hamantaschen for the base, and my classic hummus v’basar recipe for the filling! These go great with fire-roasted eggplant and homemade tahini. Combine smart balance and milk and heat until butter is just melted in the microwave. Combine flour, salt, butter and milk in the bowl of a stand mixer. Knead for a few minutes. Add the extra soy milk 1 tbsp at a time until the dough forms into a ball around the hook. Wrap with Plastic wrap and rest at room temperature for 30 minutes or so. You can either A. cut the dough into 24-26 pieces and roll into balls. Cover the ones you aren't working with so that they don't dry out. Flatten each ball into a 1/4 inch thick rounds around 3 inch diameter. Or B. you can roll out all the dough like any hamentaschen recipe and cut out circles using a cookie cutter or the top of a drinking glass. Gather the scraps, roll out and cut until you have used all the dough. Place the rounds onto a parchment lined baking sheet. Fold up like a regular hamantaschen, making sure to seal the edges well and leaving a nice size pocket in the middle. You will out the hummus and basar in when you are ready to serve. Put into the oven and bake for 13-16 minutes, until the dough is starting to look golden. Brown the meat in a large sauté pan. Discard the extra fat/liquid and put the meat on the side. In the same pan heat up the olive oil. Add the onion and sauté until golden. Add the meat back in and then add in all the spices and mix well. Add the ketchup in, mix and remove from the flame. Add the lime juice and tahini paste to a food processor. Process for a minute and then scrape down the sides. Add the garlic, olive oil, salt and cumin, process again and then scrape down the sides again. Add in half the can of chickpeas plus 2 tbsp water and process until smooth. Add in the other half of chickpeas and while the food processor is running add in half of the extra water. Scrape down the sides and add the last hit of water if the chummus is still too chunky. 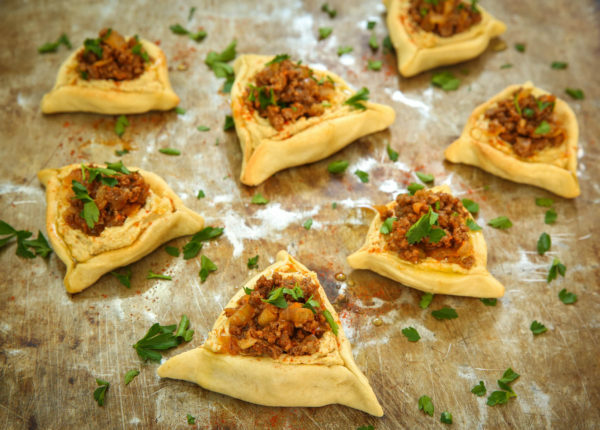 To assemble chummus v'basar pita hamantaschen, warm up the pita hamantaschen and the basar whenever you want to serve. Right before serving place around 1-2 tablespoon of the hummus in the pita center using the back of the spoon to spread it all around. Place a tablespoon of meat on top. Drizzle with olive oil, sprinkle with paprika and garnish with fresh parsley. 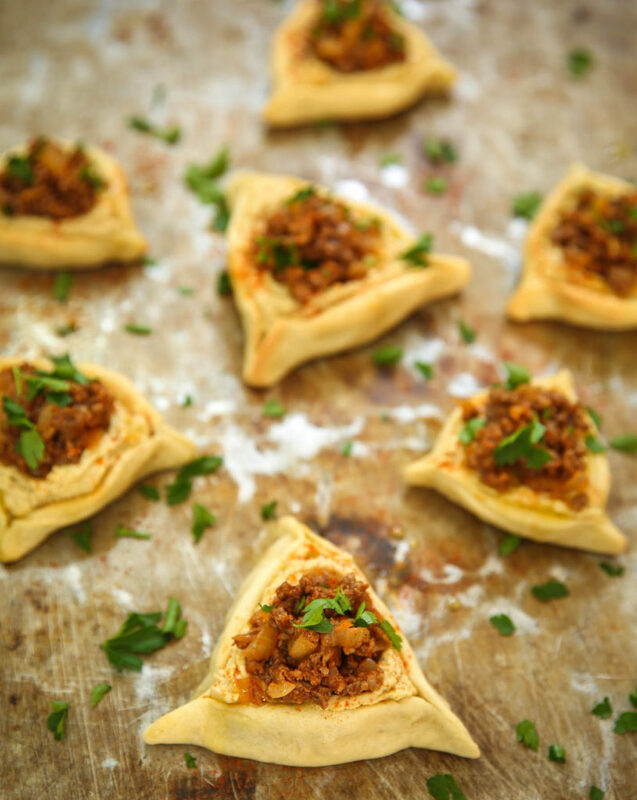 The Hummus v’Basar Pita Hamantashen recipe looks great & I look forward to trying it! I don’t understand the 1/4 water instructions in the hummus part, though. Is it 1/4 tsp, or tbsp, or cup, or what? Would you please clarify because I’m lost. Thanks ever so much! Hi! Sorry, going to edit it! It is 1/4 cup water added slowly as needed! If you like a chunkier chummus then you won’t need to use all of it, so slowly add it in until you reach the consistency you desire!